Once I was going to spend your holiday in Sicily. But then changed her mind and decided that we must once in your life to look at the famous Venice. Upon his return, and the change does not regret the choice. So, first things first: The city on the water. 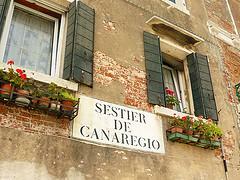 The fact that Venice is like a Saint-Petersburg e is true, but not so much, still much richer than the Venice canals, than the good old Peter. But the water leaves much to be desired, unfortunately, in some places (as long as riding a gondola) frankly smelled of sewage, and water clean will not name. However, it is normal water, almost motionless, though, and should the idea of changing sea-x. And of course, water – salt – drink it unnecessarily desire does not arise (a looking it is no desire at all:)). When I was stood duhoten terrible, so the need for dip in the cool water of a very urgent. But no fountains or sources, in contrast to all other tourist centers, where I go around was not observed. Only after careful study of the area managed to find two fresh water sources: the church of St.
Zacharias and Santa Maria della Formosa. And in Venice is the only form of transport- river! Not very convenient, but brutally romantic! And all other means are useless: on the Venetian streets do not pass on any that I know of means of transport. Even a bicycle there unnecessarily, since almost all the bridges in Venice 'humped' and for the convenience of pedestrians equipped with stairs. So on the bike especially something and did not disperse. The fact that Venice goes under the water and slowly breaks down, everyone knows. However, until you come directly to the place, do not realize the extent of destruction. It is a pity's incredible! The city really has its own aura and by some mysterious attraction, charm. And in Venice, almost no one lives. Remained a handful of patriots and fanatical hometown who are willing to endure terrible everyday inconveniences for the sake of harmony of water and stone. A flat poor repair for 2 times a year, because due to humidity all the wild plaster cracks and clambered.